The first large scale exhibition dedicated to Fyodor Fyodorovskiy at the Tretyakov Gallery. 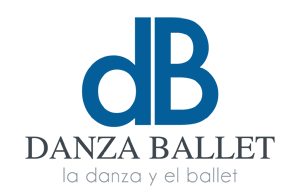 9 April — 3 August 2014. The first large one-man exhibition dedicated to Fyodor Fyodorovich Fyodorovskii is a joint venture between the Tretyakov Gallery, the Bolshoi Theatre and the Bakhrushin State Central Theatre Museum. Fyodorovskii’s name is inseparable from the Bolshoi Theatre’s history where he worked for nearly 40 years, stage designing over 30 performances. “Boris Godunov” and “The Tsar’s Bride” are still performed with his original set designs. 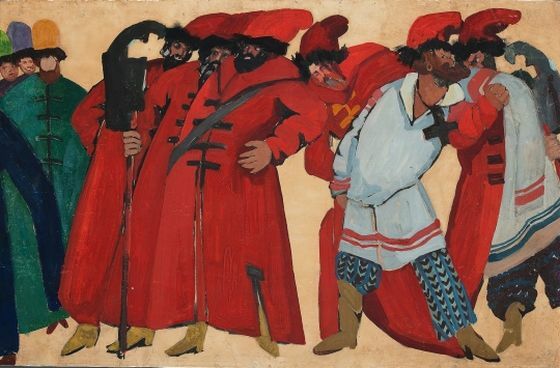 The exhibit, consisting mainly of works from the “Stage and Film Art” of the Tretyakov Gallery Foundation, will display sketches of costumes and decorations as well as costumes, backdrops and a miniature version of the famous Bolshoi Theatre stage curtain which was based on the artist’s sketches. Fyodor Fyodorovsky Lude Novgorod . 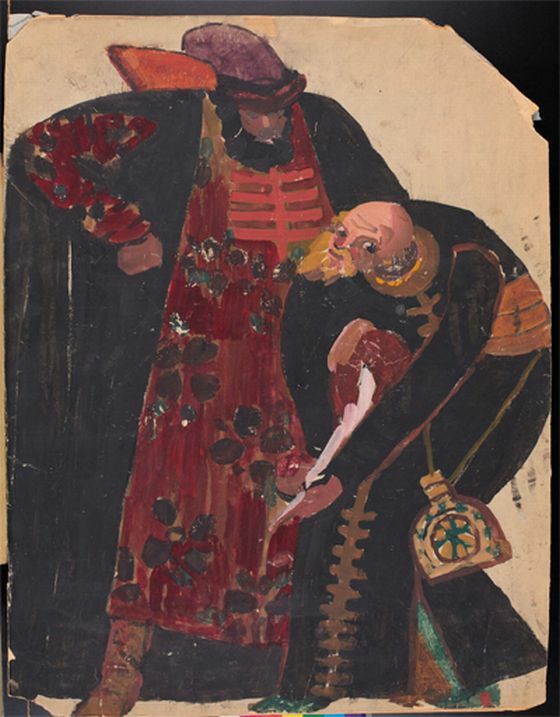 1935 Costume design for the play “Sadko” ( Rimsky -Korsakov ) . Directed VA Lossky . Conductor Alexander Melik – Pashayev . Bolshoi Theatre. The old citizens . 1934 Sketch six male costumes for the play “Faust” ( Gounod’s opera ) . Directed VA Lossky , conductor AM Pazovsky . Bolshoi Theatre. Fyodor F. Feodorovsky was born in Chernigov into a family of a railroad worker. He moved to Moscow rather early; there he was studying at the Stroganov Moscow State University of Arts and Industry (class of K. Korovin and M. Vrubel) where he majored in theatre set design. He graduated the Academy in 1907. 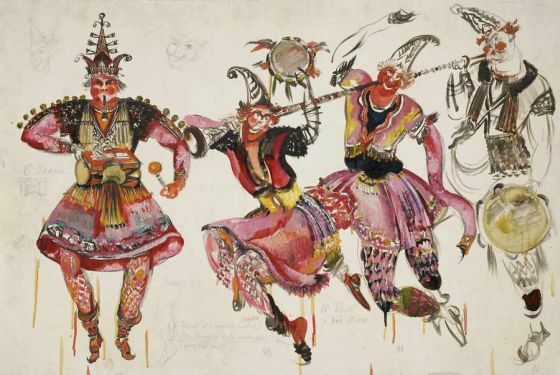 He worked at “Zimin Private Opera” until 1917; he created sets for Diaghilev enterprise productions. However, Feodorovsky devoted the major part of his life to the Bolshoi Theatre. During almost 50 years he was creating sets for the opera productions of the great Russian composers and managed to find such strong expressive means that helped to reveal and convey the richest contest of these music masterpieces. There were about 30 productions, some of which he worked on several times: “Carmen” (1922), “Boris Godunov” (1927, 1946, 1948), “The Czar’s Bride” (1927, 1955, 1966), “Die Meistersinger von Nürnberg” (1929), “Rusalka” (1931, 1937, 1944), “The Maid of Pskov” (1932), “Prince Igor” (1934, 1944, 1953), “Sadko” (1935, 1949), “And Quiet Flows the Don” (1936) and “Khovanshchina” (1950). Starting from the middle of 1930s Feodorovsky and directors V. Lossky and L. Baratov, who worked with him, established the Bolshoi production style. This was “the giant theatre style that the giant country needed and had to correspond to the grandiose scale of the socialistic construction”. Heroic and monumental works of the artist met the requirements of “the new epoch” and were appreciated by “the new audience”. At the same time Feodorovsky was always guided by the desire to make music theatre emotionally loaded; the grandiose beauty of such productions as “Boris Godunov” and “The Czar’s Bride” still strike a chord with the audience today. The production of the opera “Boris Godunov”, this masterpiece by M. Mussorgsky, was carried out by F. Feodorovsky, truly national artist who expressed vast music richness and deep meaning of this drama, the strong spirit, the scale of the people’s passions and the grandeur of the country in visual images. The painting in “The Crowning” scene is particularly magnificent, brilliant and matches the elated music. The picture dazzles with sunshine, gold of the Moscow Kremlin churches, brightness of the sky and bright colors of costumes; this picture is a true masterpiece. The Soviet audience was lucky to see two curtains designed by Feodorovsky in 1935 and 1955 that belong to the golden fund of the theatrical design. The bright talent and skill of the artist were appreciated by his contemporaries both in Russia and abroad. In 1923 at the exhibition in Paris Feodorovsky was awarded the Grand prix for the design that he created for R. Wagner opera” Lohengrin”. The importance of Fedorovsky creative work is determined not only by his work at the theatre, but also his varied pedagogical, public and organizational activity. The creation of the maquette workshop at the Bolshoi Theatre, chemical-dye shop, props department, spinning department and other departments are associated with his name. 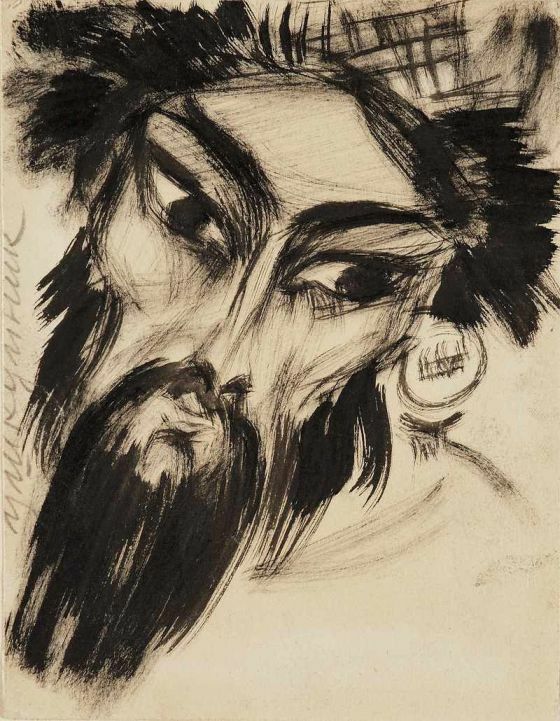 In 1918 it was Feodorovsky who initiated the creation of the Bolshoi Theatre Museum, where most of his sketches are stored today. During 30 years, starting from 1918, Feodorovsky was creating sets for the main celebratory events at the Bolshoi Theatre and the Red Square. In 1936 the artist created the paintings and maquettes of the ruby stars that are mounted on the top of the Kremlin towers. During the war the artist was supervising camouflage project in Moscow to protect the city from air raids. In 1930 he was awarded the title of the Honored Artist, in 1951 he received the title of the People’s Artist of the USSR. F. Feodorovsky is a laureate of five Stalin prizes (1941, 1943, 1949, 1950, 1951). In 1947 he was elected the vice-president of the USSR Academy of Arts. The first full-scale one-man exhibition represents an homage to the great master whose 130th birth anniversary was celebrated last year. Sketch of costumes for Khovanshchina. Strelets & Cleric. Fyodor Fyodorovsky Tsar Boris . 1927 Costume king “Boris Godunov” (opera Mussorgsky ) Directed VA Lossky , conductor AM Pazovsky . Bolshoi Theatre . 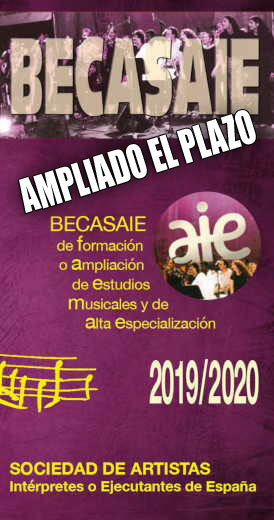 El ballet “Espartaco” es la más importante obra del compositor Aram Khachaturian. Su estreno tuvo lugar en el escenario del Teatro Kirov de San Petersurgo el 27 de diciembre en 1956, con coreografia de L.Yakobson y la escenografía de V. Jodasevich.